Conventional microscopy relies on the observation of samples prepared on a glass slide. This strategy is tedious, time-consuming, and often damages the samples being observed. Oppositely, microfluidic channels are more convenient to handle sensitive material in a biocompatible, water based environment. With microfluidic microscopy a laminar liquid flow brings samples one after the other under the window of observation. This strategy not only simplifies sample preparation process, but the liquid channel also enables repeated observation of large sample populations without perturbing their natural environment or restricting movement. Microfluidic channels are commonly used to count and classify cells in flow cytometers, and they are also adapted to observe small animals such as fish and fruit fly embryos, or adult C.Elegans. With microfluidic microscopy, we can also take further advantage of flow-controlled sample displacement as an additional degree of freedom for imaging. For instance, we can observe the same sample from different perspectives, or at various focal depths. The resulting datasets contain more information about the sample than one would obtain from a prepared slide. 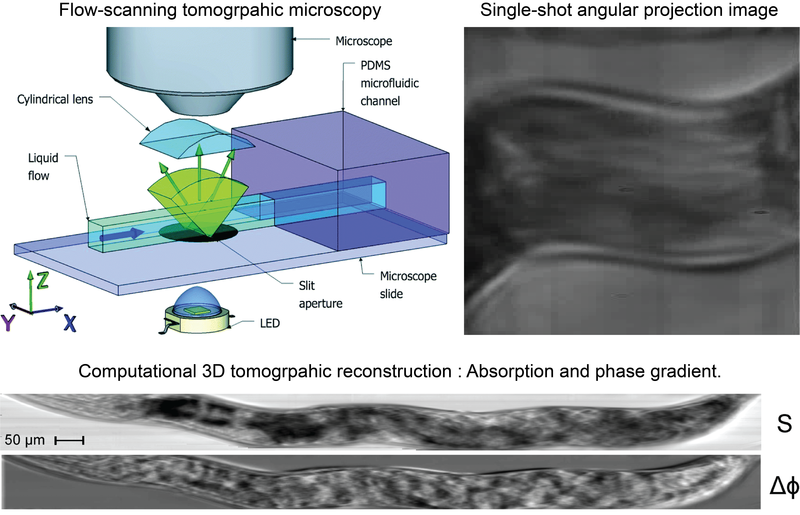 Below are three examples in which sample motion in a microfluidic channel is leveraged to obtain 3D information, phase images, or extended resolution. Our research in optofluidic microscopy aims to develop inexpensive optofluidic devices (optical hardware and algorithms) that best respond to growing needs for all-optical analysis and manipulation of large cellular-size sample populations. In this experiment, a straight microfluidic channel tilted along the optical axis is placed under the objective of a microscope. By recording successive images as the sample flows along the channel axis, we can collect for each sample flowing across the imaging window, a set of intensity measurements at different focal depths. Digital alignment of the defocused stack, and deconvolution to account for the system's point spread function yields volumetric images, and topological information about the sample. A tilted microfluidic channel is placed under the objective of a microscope and tilted along the optical axis. As samples (yeast cells) flow into the channel at a constant velocity, multiple images are recorded by a camera operating at a constant frame rate. Deconvolution of the gradually defocused images yields 3D renderings of the cells. In this experiment, a slit aperture is orthogonal to a microfluidic channel. A set of cylindrical lenses projects simultaneous 1D views of the transmitted light through the slit and sample, for a continuous range of perspective angles. The data is collected as samples are flowing through the microfluidic channels. The resulting data is a perfectly aligned set of perspective views of the samples from a wide range of angles. Computation enables the reconstruction of 3D information such as digital refocus and phase information. structured illumination enables a two-fold enhancement of resolution by modulating the illumination with a known high resolution pattern. In conventional structured illumination microscopy, small displacements of the illumination pattern are necessary to eliminate phase ambiguity. Here, we propose a new implementation with a microfluidic channel and a static high frequency illumination pattern. We rely on flow-controlled motion to achieve the necessary relative displacement between the sample and the illumination pattern and reconstruct enhanced resolution images. We illuminate a microfluidic channel with a fixed high spatial frequency pattern. As samples (C.Elegans roundworm) flow into the channel at a constant velocity, multiple images are recorded by a camera operating at a constant frame rate. 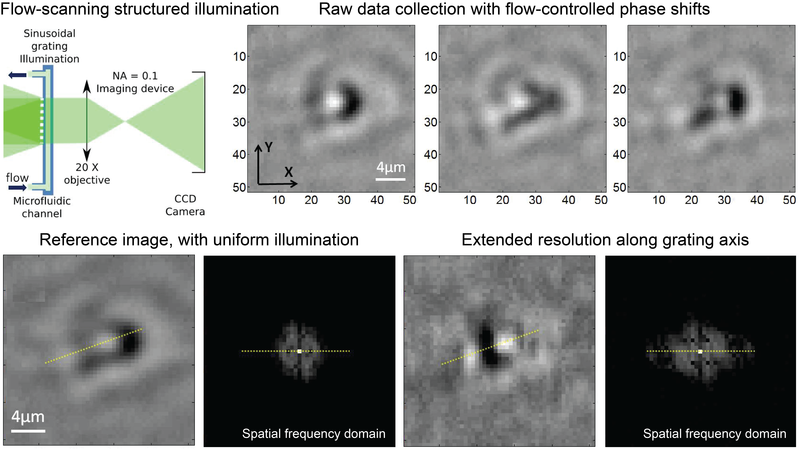 By estimating the sample speed from raw data, we compute precise measurements of the relative displacement between sample and the illumination grating and retrieve enhanced resolution images, as in conventional structured illumination microscopy.